Our Pennsylvania ATV accident lawyers have seen many victims suffer life-long complications from serious injuries sustained when their quads and All-Terrain Vehicles tipped, crashed, or rolled over. The Yamaha Rhino vehicle is more than just an ATV – it's known as a Utility Terrain Vehicle (UTV, for short). Simply put, UTVs exist somewhere between ATVs and Jeeps. Unlike traditional ATVs and quads, two people can ride side-by-side in these mid-size recreational vehicles that are known for their serious risk of rollover accidents. No matter what you call these off-road powersports machines, the risks of riding remain the same. UTV stability is an important issue, as SxS owners are often injured by rollover accidents. Critics claim that UTVs such as the Yamaha Rhino are made with their wheels too close together and their center of gravity too high, leading to serious SxS accidents and injuries. In a rollover accident, the vehicle flips and compromises the safety of its passengers. Our Pennsylvania ATV and UTV injury lawyers know all about the serious neck injuries, back injuries, fractures, scars, and head injuries caused by rollover accidents. UTVs are supposed to be about having fun, but there's nothing enjoyable about being seriously hurt by an SxS. With over 35 years of experience in helping injured quad accident victims, our Pennsylvania law firm has the skills you need on your side if you're going to go up against the manufacturer and retailer of a dangerous recreational vehicle. If you've been injured in a side-by-side accident, contact our UTV lawyers and legal staff so we can fight for your right to fair compensation. 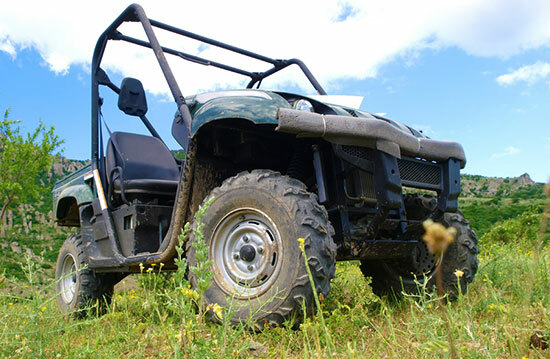 For information concerning laws for all-terrain vehicles, visit our state-by-state ATV laws page.